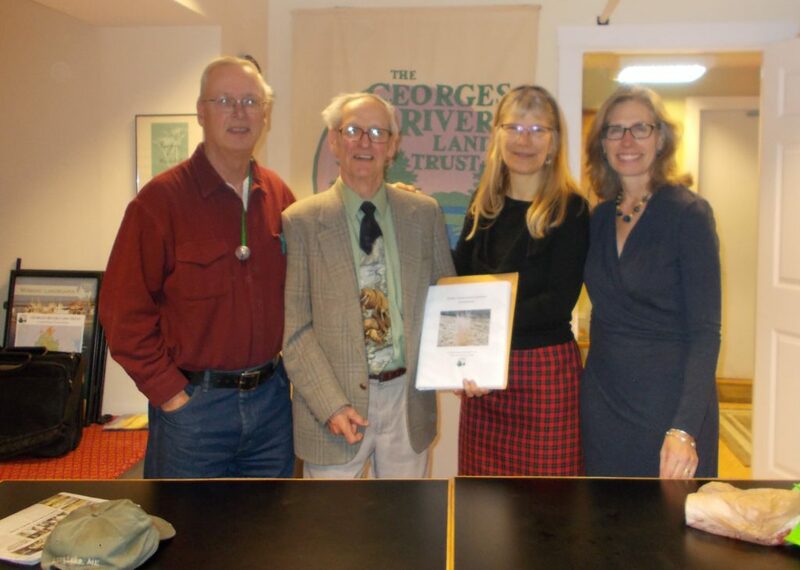 Georges River Land Trust recently closed on an addition of 43 acres to their existing 132-acre Walker Easement in Owls Head. Connected to an unbroken 788-acre roadless stretch of woodland that is incredibly valuable for a broad range of species in finding food, breeding sites, and winter shelter, the Walker Easement is steeped in family lore and traditions. Walker family members, all with deep roots in Owls Head, share a swath of land stewarded for generations by their forebears. The desire to protect “a swath of green from one end of Owls Head to the other” prevailed among this family of eight siblings who live from one end of the country to the other. With sensitivity towards this history, the family negotiated over the last seven years to conserve their land. And last month all eight agreed to add the additional 43 acres to the land they first conserved through a Land Trust-assisted easement in 2010. The land will remain in family ownership, with several members in residence on the property, and the remaining land in conservation. The recently-added 43 acres are primarily woodland and include an old quarry harvested in the 1950’s, with wetlands, vernal pools and streams providing habitat diversity throughout. Scattered across the property are patches of open fields laid out by their grandparents and located on some of the best agricultural soils in the area. The family property had been farmed for generations and the evidence lingers today with cellar holes, dug wells, stone walls, and iron implements at the edges of fields. The Walker family’s actions offer a testament of generational commitment to conservation, the legacy of preserving history, and to ensuring that open space remains for the enjoyment of future generations. As one family member said, “Each one of us takes great pride, joy and satisfaction in having accomplished something good and wonderful.” Georges River Land Trust is extremely pleased to hold this easement, and to have assisted the Walkers in supporting their family legacy, while simultaneously protecting some ecologically-significant land in Owls Head.